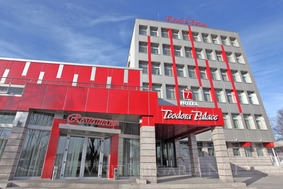 Location: Teodora Palace hotel is the newest business hotel in the town of Ruse. Its location is very strategical – international road E-85 with an immediate closeness to the Danube Bridge. Accommodation: The hotel offers 30 double rooms and deluxe studios with total capacity to accommodate 70 persons. The rooms are spacious and equipped with all amenities for comfortable stay. The interior is carefully chosen and different for each one of the 5 floors. Bars and restaurants: The spacious restaurant offers Bulgarian and European cuisine and Lunch menu. The restaurant features two halls separated with sliding glass doors which allows organizing of different events at the same time such as corporate events, personal holidays, celebrations and cocktails with a capacity of 220 seats. Conference facilities: The conference hall with capacity up to 140 persons is a perfect place for corporate events, meetings, trainings and seminars. The hall is equipped with professional presentation technology, natural sunlight, high speed wireless, and wired internet access. The hall is provided with a spacious terrace that is multifunctional and suitable for coffee breaks, cocktails and other outdoor events. For your business meetings at your disposal is another convenient conference hall with 30 seats offering audio-visual equipment, Internet access and business atmosphere. Facilities: The hotel offers a summer garden /for 150 guests/ for a relaxing cup of coffee, refreshing drink or lunch. The summer garden is suitable for business meetings, cocktails, weddings, children’s parties and other events. The hotel offers guarded parking and free wi-fi internet.